Ohne viele Worte, dafür mit etwas mehr Bildern zeige ich euch heute eine Karte, die ich für meine Tochter gemacht habe, die letzten Sonntag eigentlich ihr Seepferdchen-Abzeichen hätte bekommen sollen. 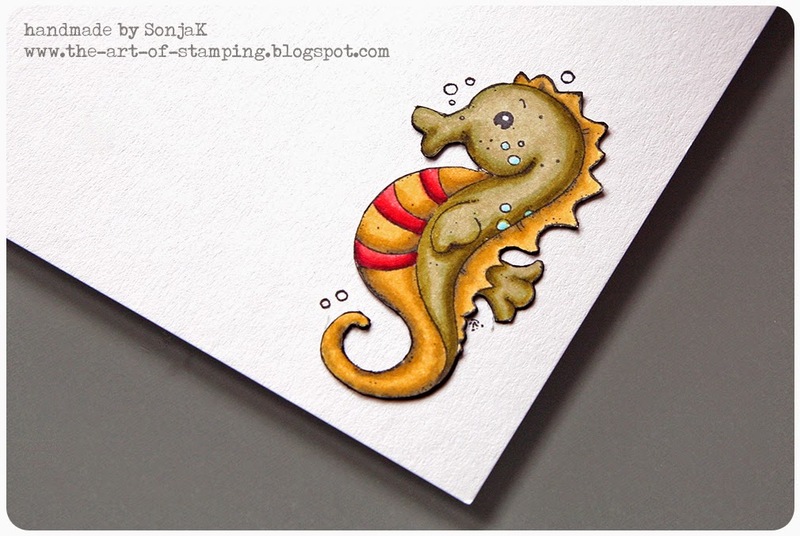 Without much ado but some more images than usual I'm today showing you a card I made for my daughter who was supposed to get her entry level swimming badge, which in Germany is symbolized by a sea horse, last Sunday. Verarbeitet habe ich habe ich auf dieser Karte die "Beach Tilda" und den "Bathing Ring" aus der Lazy Summer Collection 2009 von Magnolia. Koloriert habe ich die Motive mit Copics. For my card I used Magnolia's "Beach Tilda" and the "Bathing Ring" from the Lazy Summer Collection 2009. I've colored the images with Copics. Ein Seepferdchen durfte auf der Karte natürlich keinesfalls fehlen. Das versteckt sich im Innenteil wie man auf den beiden unteren Bildern erkennen kann. Of course, there also had to be a sea horse on the card. This is hidden in the inside of the card as you can see on the two images below. Meine Tochter hat sich riesig über die Karte gefreut, denn ihr habt am Anfang ganz richtig gelesen, das Abzeichen hätte sie letzten Sonntag zwar bekommen sollen, da sie schon vor eineinhalb Monaten alle dafür erforderlichen Aufgaben bewältigt hat, doch leider musste der letzte Schwimmkurs vor den Ferien wegen einer defekten Chloranlage ausfallen, und so steht meine Süße weiterhin ohne Abzeichen da. Ich hoffe, ich kann die Schwimmschule dazu bewegen, es mir noch vor Weihnachten per Post zuzuschicken, da es sonst wohl einige Zeit dauern wird, bis sie es bekommt. My daughter was thrilled to receive the card, not least because as I wrote at the beginning she was supposed to get her badge as she already completed all tasks required for it back in October, but she didn't. The last swimming lesson before the Christmas holidays, when the badges are usually issued, was cancelled because of a broken chlorinator at the pool, thus my little one is still without her badge. I hope I can get the swimming school to mail it before Christmas otherwise she'll have to wait for it. Stempel: Magnolia "Beach Tilda", "Bathing Ring", "Sea Horse", SU "Kleine Wünsche"
Stanzen: Mama Elephant "Basic Set"
What a precious card for your daughter, Sonja. Love the clean look of your card, keeping the focus on Tilda. You've coloured her beautifully...and the seahorse too. My my!! U are awesome :) love the coloring and the stripes BG is a fab addition to the design ! Such a sweet card and stamp! Your colouring is fantastic. 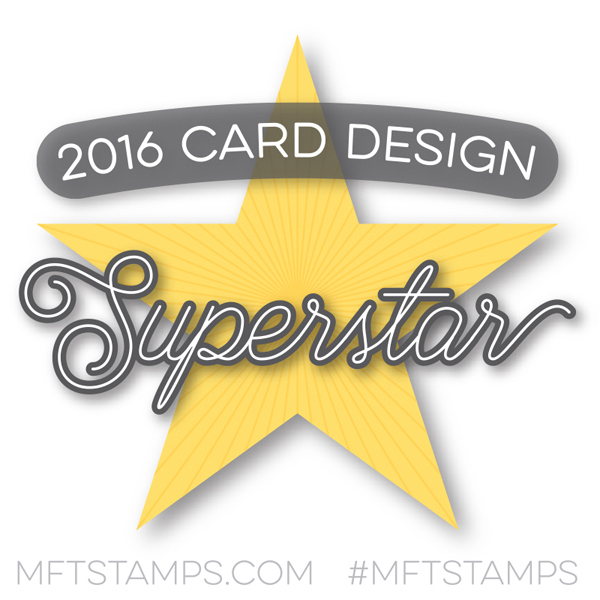 Thank you so much for sharing with us at Simon Says Stamp Monday Challenge Blog! Merry Christmas!! So sweet, I love the crisp and clean look to it! Thanks for playing in our Anything Goes challenge at Magnolia-Licious and Good Luck!